The day I made this was one of those days. I haphazardly made a bread dough in the morning. Failure. I made it again. Then I accidentally baked it in the oven in the bowl it was proofing in. Failure. I needed something that was easy. Eyes closed with a fragmented brain easy. And comforting. Something that took me far away from my rogue doughs and to do list. That’s where a Lindt EXCELLENCE bar of the Intense Orange variety came in. First, I ate a square, calmed down, and thought of how to rescue my baking day. The complex flavors inspired me. My mother always put those chocolate oranges that you smash and eat the wedges in our stockings as a kid. Chocolate orange is the flavor of the Christmas and childhood all rolled in to one. But I’ve since grown out of milk chocolate (nothing against it, love the stuff, but nine times out of ten I go for the complex, dark stuff), and I prefer the thin & impossibly silky melt of Lindt EXCELLENCE bars. I buy them compulsively on a weekly basis (along with their Lindt LINDOR white chocolate truffles which is an obsession of mine for another post…long story short I’ve been a very vocal detractor of white chocolate until I met those truffles.) The chocolate, memories of Christmas, and my favorite amongst southern iconic desserts came together in my mind. And that’s how the easiest, most delicious bread pudding I’ve ever had the pleasure of eating came into being. Some Lindt along with a little desperation. And pointedly southern hunger. I’ve always eaten Lindt, but recently I had the opportunity to visit their head quarters and factory. It was a real life Willy Wonka experience. But instead of Willy Wonka it was their kind, charismatic CEO and instead of schnozberries it was more truffles than I have ever eaten in my life. And it was falling in love with white chocolate, something I never thought would happen. When they first reached out, I immediately researched them. What I found was a company that gives back, ethically sources their cacao, and retains an intensely human heart & passion despite how they’ve grown over the past century. Well, far more than a century. They started making chocolate in Switzerland in 1845. They know what they’re doing. They introduced us to the concept behind all their brands from EXCELLENCE to LINDOR to HELLO, and while I didn’t need to be sold on their chocolate, it was inspiring to hear the moments they envision their chocolates creating in people’s lives. I’m always going on about carving out time, making moments. A square of Lindt EXCELLENCE slowly melting in your mouth (I like to make it last) is one of those moments. One that sort of suspends space time & takes you into yourself and quite the world around you. Chocolate is mysterious like that. And their bars engage all of your senses. They defeat distraction. So much so that they actually make a great option for a wine pairing (or in my case and equally amazing a tea pairing…which I got to experience while in New Hampshire visiting them). I didn’t want to disguise the experience of their chocolate in a recipe, but rather, I wanted to amplify it. So I turned up the volume on the orange with zest, juice, essence, and orange liquor and kept the rest very, very simple. The only spice I ended up using was a little bit of nutmeg to highlight the nutty bits of almond in the bar. I was going to use cinnamon, but it was just too much. I needed the chocolate to sing. Secondly, I needed it easy. Insanely easy. So easy you can’t believe it’s going to be amazing. And that’s what this is. You can make it on your worst day. We all need something like that in our arsenal. Something impressive that induces those wide eyes when people taste it and requires no brain power at all. You don’t even have to separate a single egg. Just make sure you get a decent loaf of challah. Brioche would work well too. If you’re not having one of those days (or, ahem, weeks) you could certainly bake your loaf from scratch like a wizard. But a fine loaf from the bakery is what I used here. No shame in that. Bakeries exist for a reason. So! Without further ado, get thee to the recipe. This is going to make multiple appearances on my holiday tables this season. It’s luxury, nostalgia, and ease. What could be better for both the most festive and busiest time of the entire year? Nothing, y’all. Nothing. All I can say is get a bar of this and make it, like, yesterday. It’s that good. My parents, who, being southern, are bread pudding connoisseurs, said it was a 10. That’s something. Thoroughly butter an 9" skillet or baking dish. Sprinkle to coat with sugar, shaking out any excess. Toss bread bread with the chopped chocolate and then arrange evenly in the skillet. In a large mixing bowl combine the cream, milk, juice, Grand Marnier, extracts, eggs, sugar, zest, nutmeg, and salt. This is the part that matters. Whisk all the ingredients. Whisk them well. You want the sugar to be largely dissolved and the eggs evenly distributed. The mixture should be creamy, consistent, and thick. Give it one last good whisk and pour it over the bread cubes. Immediately pop it in the oven and bake for 30 minutes or until the top is crisp and golden brown and the center is cooked through but still moist. Serve hot. A bit of powdered sugar or condensed milk drizzled on top is always a win. This recipe was graciously sponsored by my friends at Lindt. The opinions are, as always, my own. Oh my……this is going to be my weakness over the holidays. I so enjoy your writing and photography. Keeps me calm in this crazy ,crazy world. Many thanks for your culinary creativity and thoughtful prose. That intense orange chocolate has my name written all over it…and this pudding is so beautiful in the skillet — almost too pretty to eat! This is GORGEOUS and looks just as delicious! I am so excited about this recipe. I have been looking for a good bread pudding recipe and I think this is it. I love that it has orange flavour. Like you, it reminds me of the Christmas season. And, we always put the orange flavoured chocolate in our kids stockings, too. I bet it might end up becoming a traditional dish. Thanks for sharing. 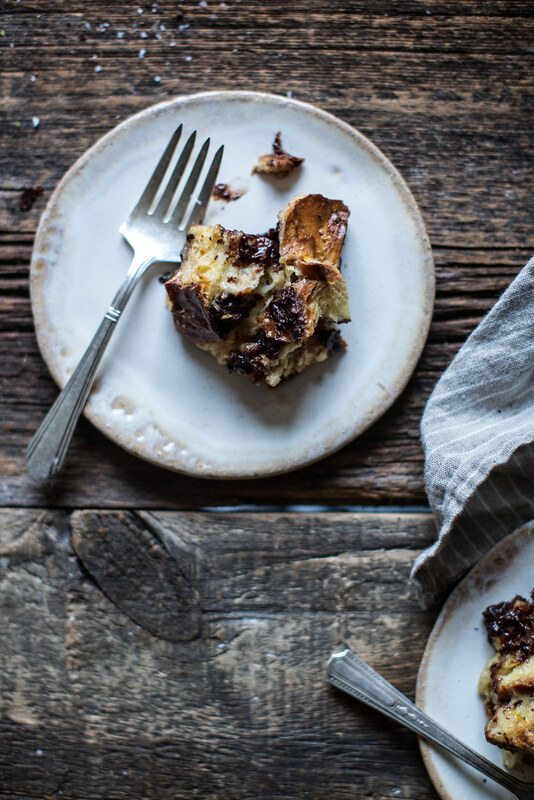 I am addicted to bread pudding, and not fussy at all when it comes to it, partaking of every type of bread pudding as I happen to lay my hands on. And so is my husband, and thankfully, so is our son. When it’s cold, and dreary, and you want that something sweet to finish up a meal and have next to nothing in the pantry or the freezer that will serve as a dessert, we turn to bread pudding – and another recipe, but that one I will keep secret for now as I want to share it on my own blog, as it was our invention! – and it never fails. It delivers, everytime, that warm feeling that starts in yoyr tastebuds once you take the first spoonful in and just dives down to your stomach, making you all comfy and toasty and happy, and it’s the one dessert that goes a long way, since it’s got bread in it, it doesn’t take much to make you feel full and content. 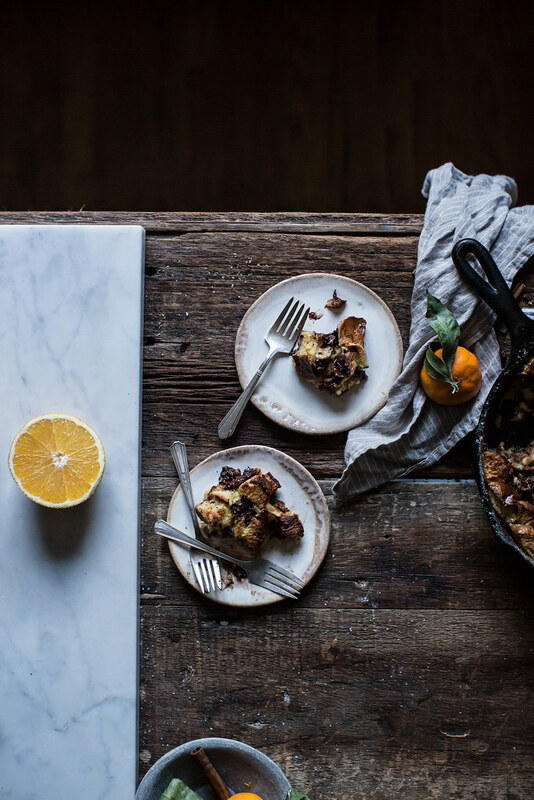 Never in a million years has it crossed my mind to bake a bread pudding with chocolate – and that’s why you’re Beth and I’m just a tiny ant learning form the great – and orange!! THe sound of it is immediately appealing to me, I love the pairing of orange and chocolate, sadly at my household I am the only one. SO this got me thinking, what else goes so well with chocolate? Coffee… hmmm… think that’ll work?? YES to back-pocket, all-else-did-fail recipes that erase all the disappointment/feelings of waste with that first bite — soo so necessary. 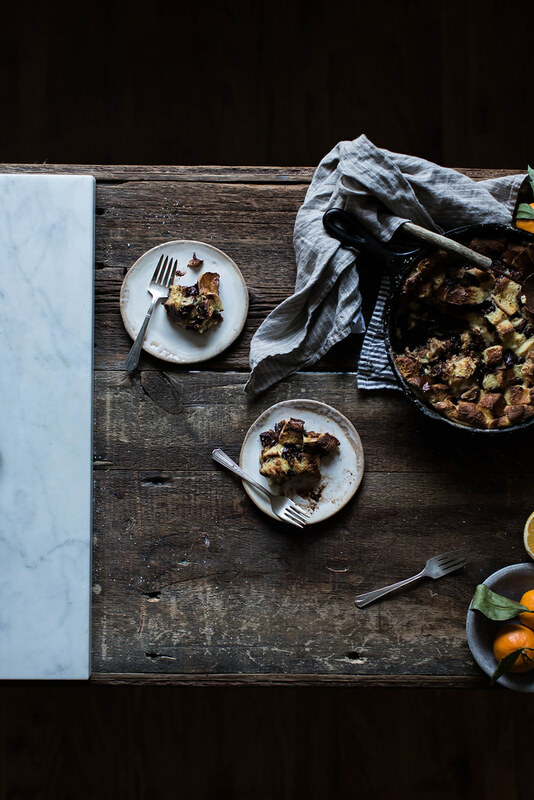 But this bread pudding looks so magnificent that I’d never guess it was an easy last resort. Loooove this, Beth. Easy and totally delicious! Man, this looks freaking awesome! Holy moly. 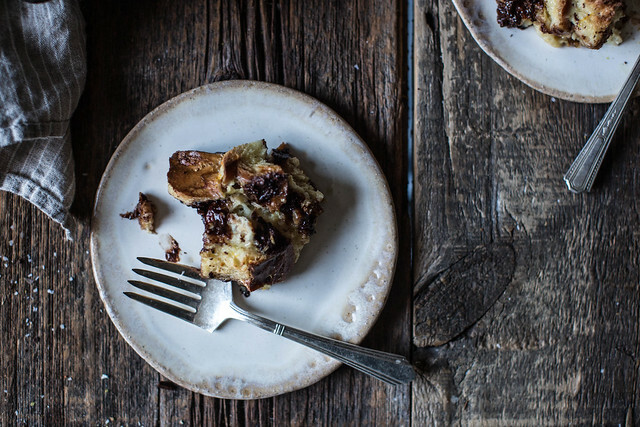 This bread pudding is from the heavens! There is something about chocolate and orange that just really rocks my world….yum!! What else do you use orange extract in? Recipe looks great, but that isn’t my usual pantry item. Better to skip it? Or do you have other suggestions? This looks so delicious! 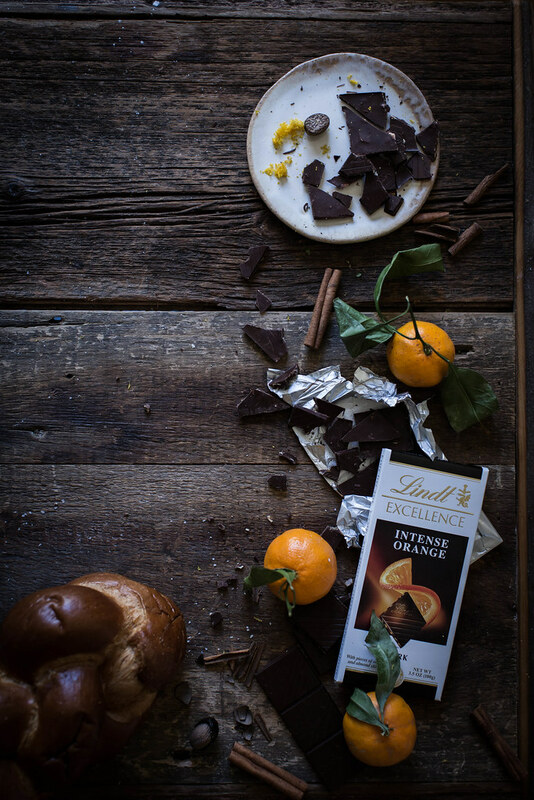 I love Lindt’s orange chocolate, so will definitely be trying this recipe out. The pairing of fruit and chocolate has never been appealing to me… I always hope that the chocolate that I choose from a box is filled with caramel or more chocolate… not the fruits. But I love the orange + chocolate combo. The orange ads a subtle and surprisingly (for me!) nice flavor. I’m gonna make this puddin’. Your side and photography is so beautiful , I am definitely a new follower ! Perfect for Christmas – lovely flavours. This looks fantastic! How fun to be able to go to the factory! You really know how to bring things to life. Thank you for sharing! This looks great! Do you have suggestions for the chocolate tea pairings? Yes, well, I could get into this. Pondering if I have time to squeeze the pudding in to my potluck offerings tonight. And I almost giggled when I saw your last shot. I guess it is more telling of my own my affinity for – or proximity to – the dark. Though! I rather like the second, lighted shot as well. Lightens me. 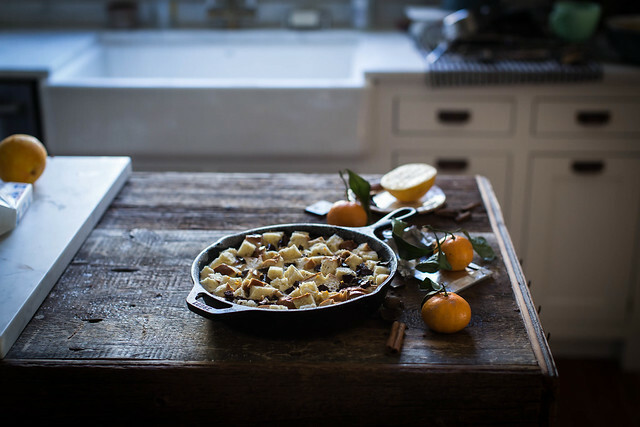 Hi, after this post I have to try my first bread pudding in my life …uuups! 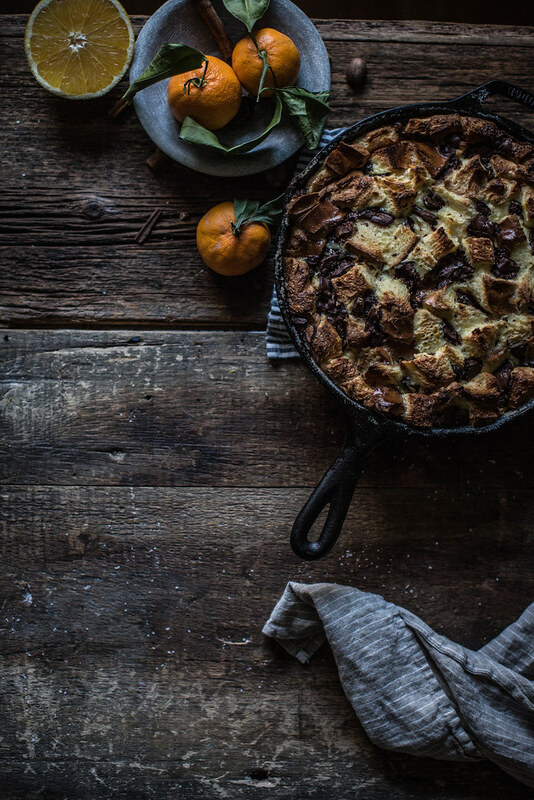 Chocolate orange is like my crack, and this bread pudding looks incredible. Stunning! 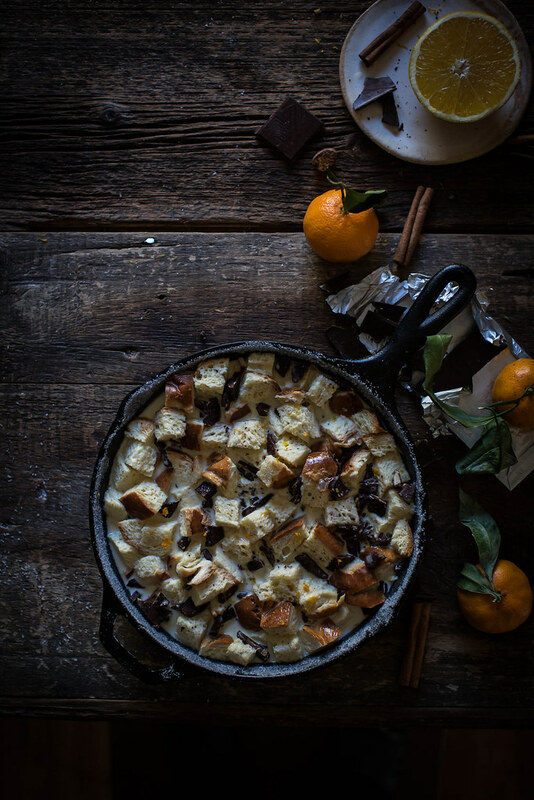 Bread pudding is one of my favorite things to eat this time of year. So perfect for Christmas morning or other holiday gatherings. And chocolate + orange = heaven. Always. Beautiful job! My mom always put those smashable chocolate oranges in the toes of our stocking too. I am always inspired by the sentiment and nostalgia often found in your recipes. Oh man. I’ve never really given bread pudding a fair chance. I don’t know why, its bread…which I love…and pudding…which I love. 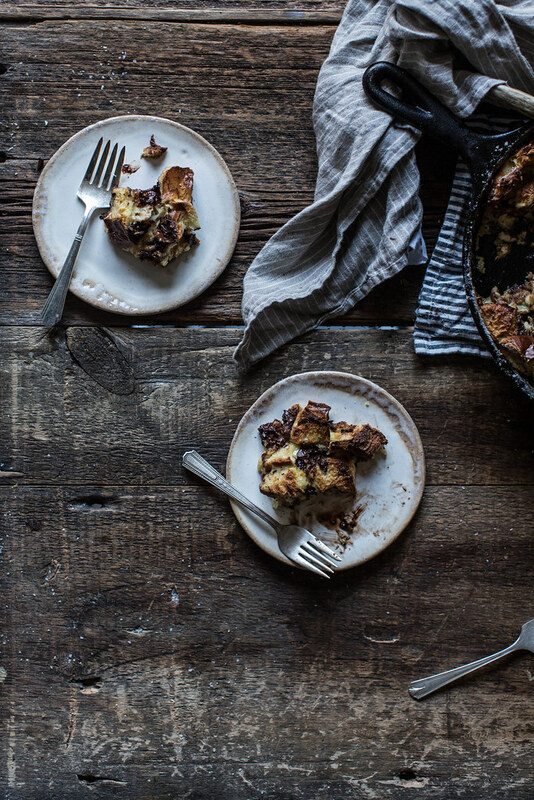 I think this recipe, however, is going to make me a full blown bread pudding addict. It looks perfect. So gorgeous, and so delicious. Great recipe, Beth! So in love with these pictures!! And Lindt chocolate does tastes so good indeed! Kept looking but couldn’t find the response to the question of orange essence above. Also, I don’t have any grande marnier in my pantry. Substitutions? 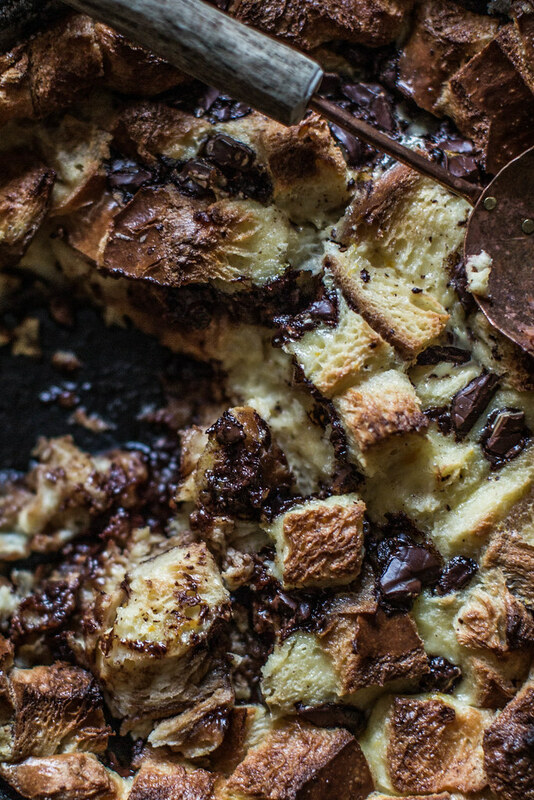 And HOW do you stay so thin if you love chocolate and bread pudding so much? You can omit the Grand Marnier. And I like to use orange blossom water instead of essence now. I get it online or from my local middle eastern grocer. And for the record I’m NOT super thin post baby. LOL And two…I love to make chocolate and bread pudding more than I love to eat it! I consider it a feast day food and we only make decadent desserts for special occasions be they happy or sad.